The opening week of the 2018/19 season in the Dundee and District League heralded fixtures in first round of the Stanley doubles. Second division Truants and New Kids both managed relatively straightforward victories against third division teams, Tass and Duffers respectively. On the other end of the spectrum, second division Swots and third division Prospects predictably fell at the hands of first division opponents Viscounts and Aces. Any deviation from the above results would have been a huge surprise. The victors of the first week clashed in the opening match of the new league season in a local derby as the New Kids travelled to Gauldry to play Truants. With Truants as second division title contenders, and the Kids hoping to avoid a relegation battle, expectations were confounded as the New Kids stunned their rivals in an emphatic 7-3 victory. It was an excellent result for Ian Smith, undefeated on the night, Howard Lee, with two wins and Ken Falconer who scored one point for the team. New Kids will be especially pleased to have taken (twice) one of the most coveted scalps in Division 2, namely Sascha Roschy, who could only manage to beat Ken while Graham Wood overcame Ken and Howard. Knut Radner was unfortunate to leave with nothing despite taking Ian to a deciding set. Also in Division 2, the Swots bounced right back after being eliminated from the Stanley doubles cup with a solid 9-1 victory over the Tigers in the league. Colin Bleak and Nick Shepherd combined well in the doubles to add to their splendid individual hat tricks, while Dave Beveridge was only defeated by Scott Thomson. Marion Davidson and Kenny McLaren for the Tigers were left to lick their wounds as they struggled and were unable to score any points on the night. In Division 3, Prospects opened their league season with a commendable victory over Missiles 6-4. Chris Wroniecki was the sharp shooting man of the match, taking home an undefeated hat trick of wins, while Charlie Ross secured two points and Dave Goddard one over the misfiring Missiles. Last but not least, Prefects in Division 1 secured their first win for the loss of only one game by reserve Sascha Roschy. Michael Hahn and Justin Yang remained undefeated in singles as well as in the doubles match. Their newly promoted opponents from Brechin comprised of Andrew Crawford, Aaron Robertson and John Anderson, the latter taking the only point on the long, long journey back to Angus. 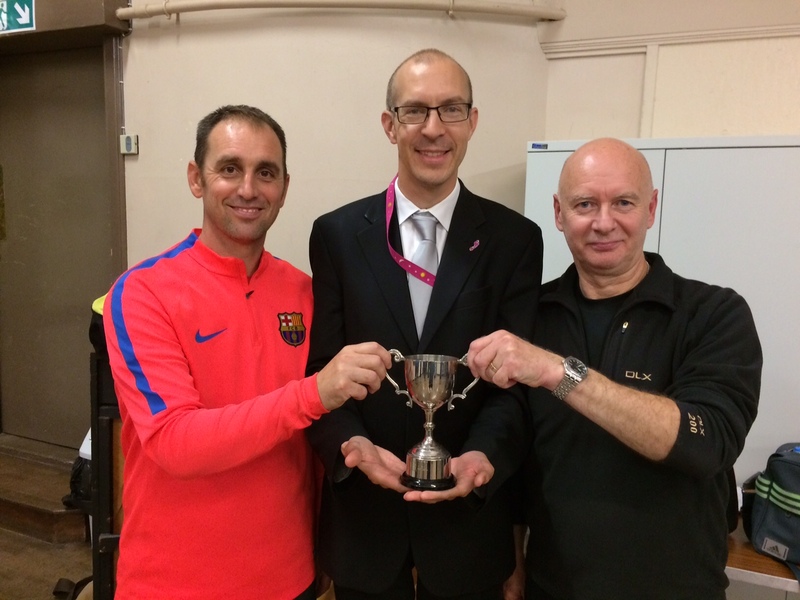 This entry was posted in Match reports, St Andrews Table Tennis Club on September 25, 2018 by standrewstt. Thirteen players at St Andrews Table Tennis Club dusted their bats to compete in the Eglinton Cup, the now traditional opening tournament of the season at the Victory Memorial Hall. If the Eglinton trophy can be used as a barometer for the season to come, the pair to watch for the start of the competitive play on September 10th is Dave Beveridge and Chris Wroniecki, who took the final with a commanding 4-1 victory over Michael Hahn and John Carlton, the latter winning the only end for the runners up on the deciding point. The tournament, organized by Elaine Forbes and Alain Leger, is handicapped, to even the playing field and make the outcome more unpredictable. With many games going to sudden death, all players shared a fun and exciting evening. Dave equaled a club record on the night, taking the trophy home for the third time in the last four years. The evening was also marked by the last appearance under the St Andrews banner for Emma Bissett, who had an impressive night, conceding only one set during the event. Emma’s good nature and friendly attitude will be missed by all, although she has threatened to drop in occasionally at social events. All league players are now focusing on the new season looming round the corner. The club will enter five teams again in the Dundee and District League, in the same divisions as last year, as all the teams avoided promotion and relegation alike. Leading the charge with the elite team in 1st division are the Prefects, but the club is represented in greater numbers in the second division with the Truants, New kids and Swots. Whereas in third division, the Prospects have renewed energy and focus and could well impress this season. The club would also like to invite new players, either beginners or adult returners to drop in at Victory Memorial Hall at any time on a Monday between 1:30pm and 4pm to join the Rascals group. As a safe and relaxed environment to enjoy the sport in a leisurely manner, this is a great introduction to the club. Those who wish to play competitively are also very welcome. This entry was posted in Eglinton Trophy, Match reports, St Andrews Table Tennis Club on September 4, 2018 by standrewstt.